If you’re searching for a deck company serving Collinsville, Illinois, that you can rely on to provide top-notch products and installation services, turn to Chesley Fence & Deck. We are a family-owned and –operated company that has been serving local homeowners since 1967. As one of the most experienced decking and fencing companies in the area, we’re proud to have maintained an unparalleled commitment to customer satisfaction, which has resulted in our long-standing A+ rating with the Better Business Bureau. One of the advantages of choosing Chesley Fence & Deck as your deck company in Collinsville, IL, is that we offer versatile services and will custom build a deck that fits your budget and preferences. For example, if you’re looking for a highly cost effective option, we offer premium treated lumber decks that can be stained or painted to your liking. We can also build decks from top-quality Western Red Cedar, which have outstanding durability as well as a warm, natural appearance. 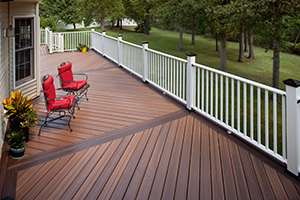 To learn more about what makes Chesley Fence & Deck the finest deck company serving Collinsville, IL, contact us today.